It’s that time of year again where wedding season is upon us. Each week we hang up the “projects” (cakes) on the walk-in fridge in the kitchen. This is a central location where you can see what is being delivered for the weekend. But the question is how do the cakes get to this stage? Cake orders on the fridge wall and waiting to be executed. – Meet with clients. During consultation, design and flavors are agreed upon. Sometimes an additional meeting is needed to firm up details. – Contract goes out, signature is received approving all details. Ron is meeting with one of our clients. Possible inspiration for her cake is using some of the details from her invitation. – Go over all cake orders to make sure clients have sent in swatches, pictures of inspiration and cake flavors. – Print out cake orders and match with all related materials for production staff (this includes dress details, flowers and other various items of inspiration). 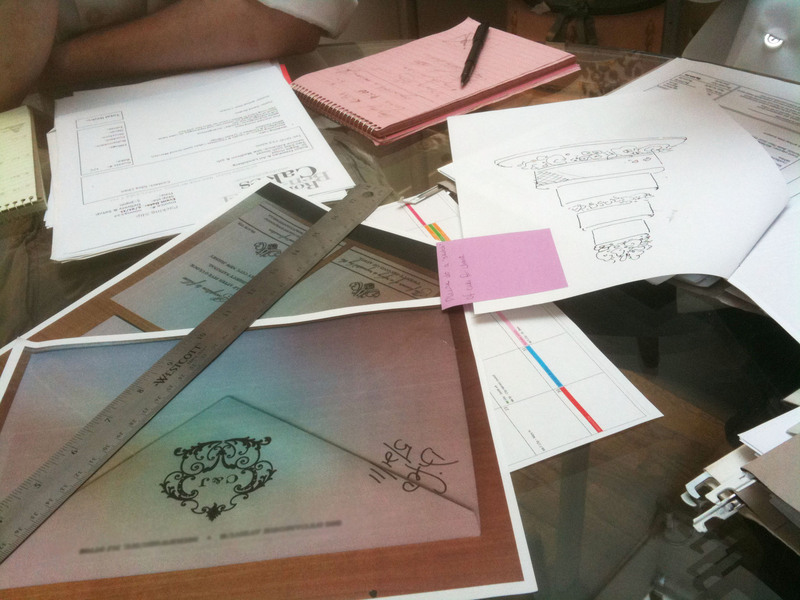 – Production meeting with Ron, Jeff, Jason and myself where we talk about all cakes and design elements. 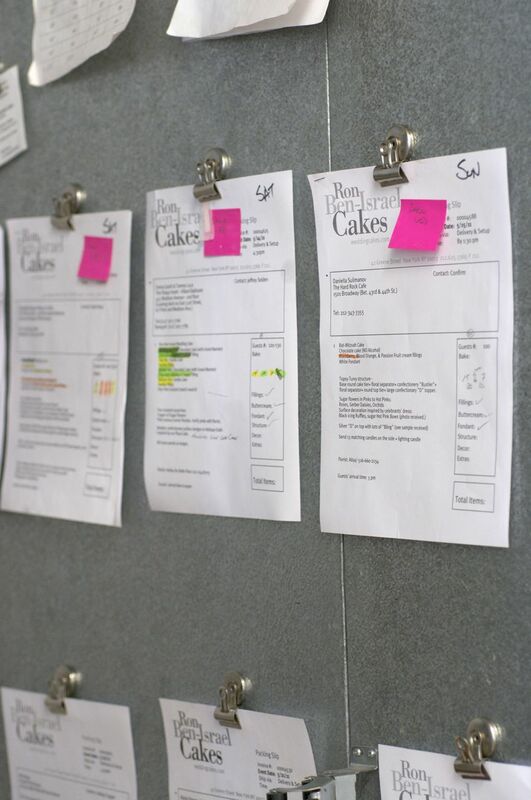 – Jason, our production manager, goes through all of the cake orders and makes lists of all the flowers that need to get made. Then those flowers are divided up amongst the production staff to complete. 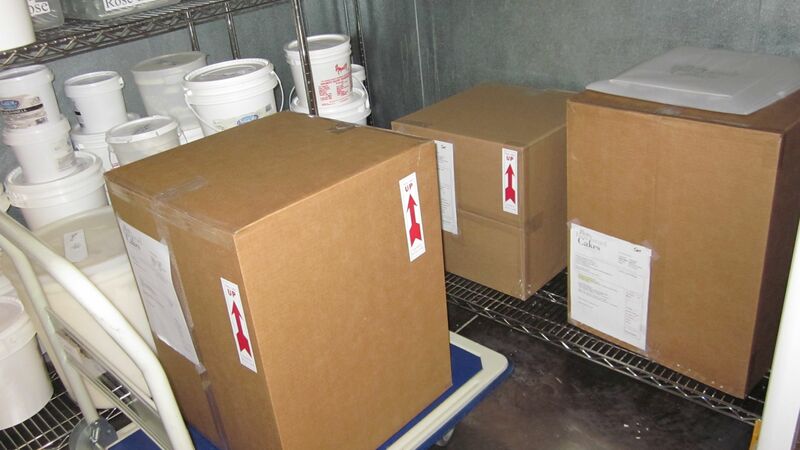 – Jeffrey, our head chef, goes through all of his orders to make sure we have the ingredients, if not orders are made. – Delivery schedule is completed. This is what our production meeting table looks like. Figuring out all of the elements for a floating tier cake. – Cakes are baked, filled, fondanted. – Cake goes into production room where staff is paired with interns to complete surface and flower design. – Cakes are boxed and put in fridge over night. 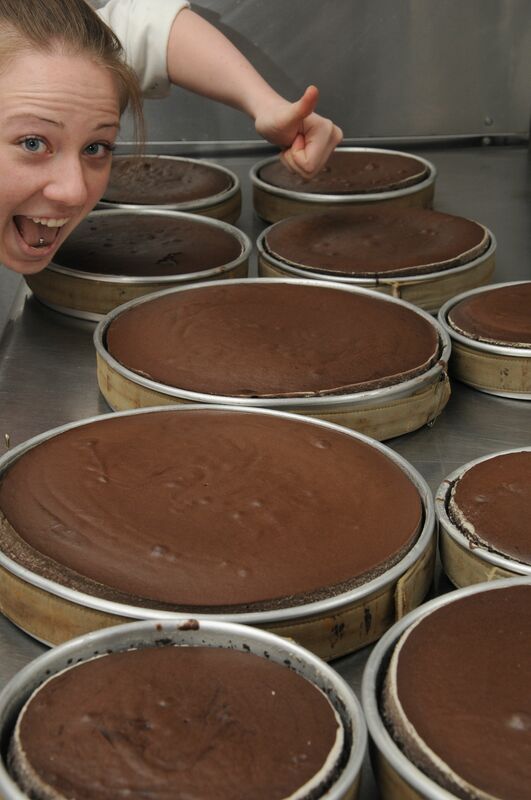 Sous chef, Robin, giving me the all clear for delicious chocolate cake – hot out of the oven. 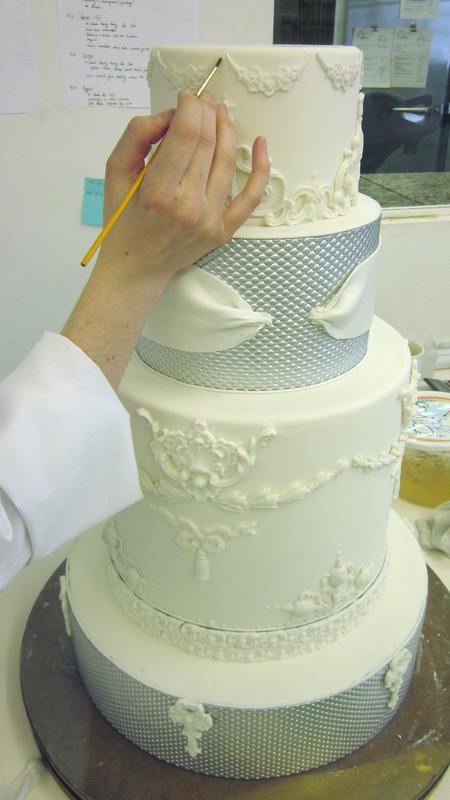 Sugar elements being applied to the top tiers of a cake. Ron and head chef Jeffrey trying to figure out box size for a cake. Cakes all boxed up and ready for delivery. – Cakes set up on location 1.5 hours before guests arrive. 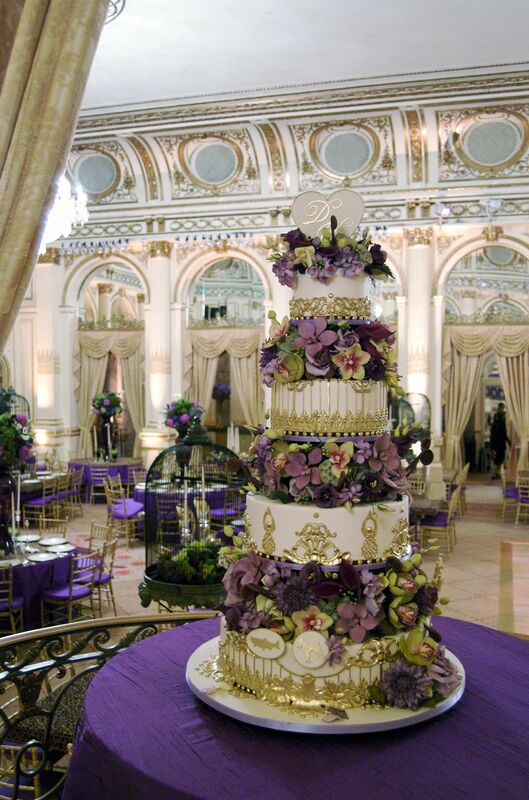 This floating tier cake is unpacked, put together and ready for a wedding reception at the famous Plaza Hotel. There are a lot of little details that need to be managed, thankfully there is a logic to it. When you have a big month, some of this process can be a bit overwhelming. But I have a good team of people to rely on. Because all of us go over the material in our own different way, if there is any gap in the information, one of us can usually point it out. So there it is from start to finish….it’s one thing to read about it – it’s another thing to see the final product.